The Harbor 1 windshield service center is a perfect addition to a gas station island. The combined unit saves on space and provides a much appreciated station for quick trash disposal and a self-service windshield wash while your customers fill up on gas. The waste container opening measures 8" Square. 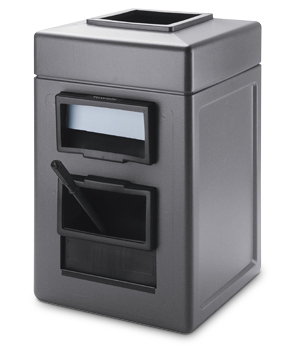 The standard size towel dispenser accommodates 1 or 2-ply folded paper towels, the suggested towel size is 10" x 10". The black unit is made from 50% post consumer recycled (PCR) material. The gray and blue units are made from 25% PCR content. All models are shipped in a carton made from 50% recycled content. Removable 2 Gallon Water Bucket.